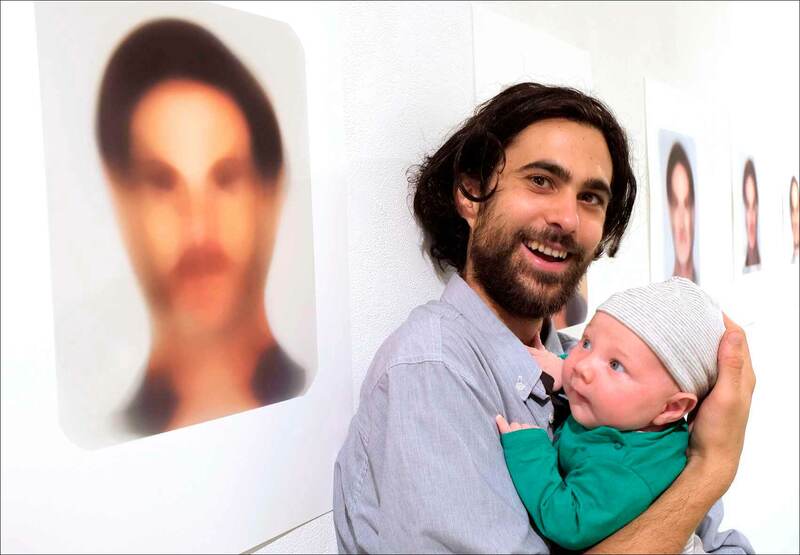 Art lovers: my son Ari (29) cradles his nephew Finn (8 weeks) who is intrigued by a picture of me at about 29. Some say Ari looks like me at that age. A weird generational loop. The photo was taken at the opening of my new group exhibition Persona, at St John Street gallery in Prahran. Persona is a group exhibition opening next week at the St John Street gallery in Prahran. 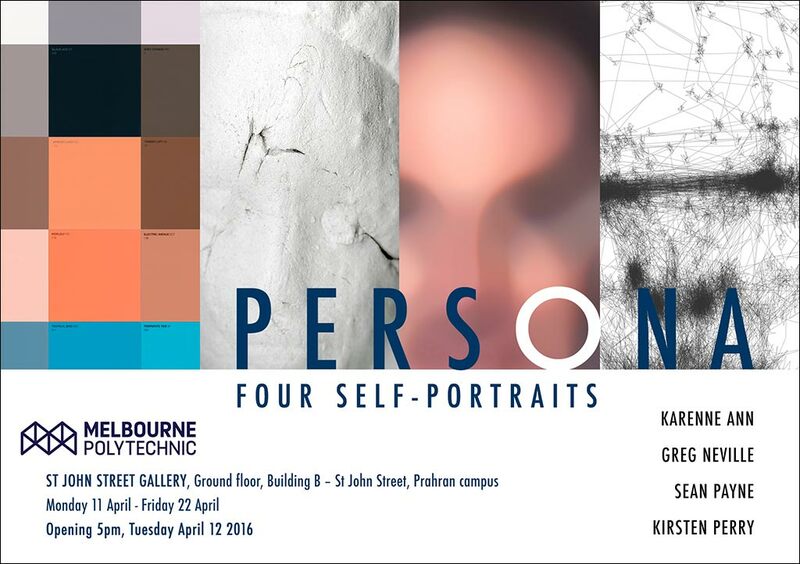 Four Visual Arts colleagues at Melbourne Polytechnic are showing self-portrait projects framed by the word persona. My Dust and Scratches project is part of it, along with work by Karenne Ann, Sean Payne and Kirsten Perry. The word Persona describes the public aspects of character rather than the psychological, a social role or a character played by an actor. The long history of the self-portrait genre has not only involved portrayal of the “self” as in Van Gogh’s disturbing self-portraits or those of the German Expressionists. A more expanded or system-based approach to the self-portrait runs alongside this tradition, for example Francesca Woodman‘s playful, performative nudes or Chuck Close‘s giant forensic paintings of his photographed face. Karenne Ann’s sculpted and scanned heads are little death masks in plaster, commentaries on misguided illusions as they apply to women and to herself. 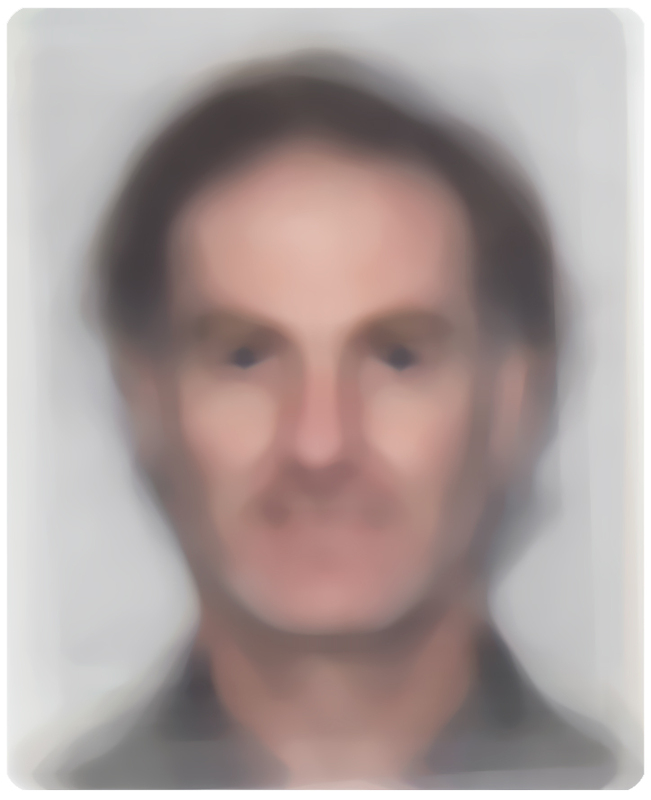 Greg Neville’s self-portraits are derived from his collection of identity cards dating back to 1974. Kirsten Perry’s uses the technology of eye-tracking, giving the record an empirical basis and intentionally removing the the artist’s hand, the better to isolate and examine vision as a process. The Persona opening is at 5-7pm on Tuesday April 12 and runs until Friday April 22. St John Street gallery is on street-level in building B of Melbourne Polytechnic’s Prahran campus, just off Chapel St and High St. I was looking at my collection of 20 ID photos of my face, passports and staff IDs that record the changes to my adult face going back to 1974. The question was: what is the average of that face? I scanned the photos and stacked them in 20 Photoshop layers. The eyes were used to align each photo and the layers were set to the same transparency of 5%. When it was completed, I was looking down through the ghostly images to see the essential form of my face, the visual average that says – me. The resulting face you see above is both 24 and 64 years old, and everything in between. It is a further degree of the ID photo genre – it identifies me in all times of my adulthood. This image is part of my new exhibition project called Dust and Scratches. This was named for the Photoshop filter used to blur the face into a more generalised visage, but also, with irony, to describe the visible effects of ageing during the 40 year span of the photos. Dust and Scratches will be displayed in the new exhibition Persona, at the St John Street gallery in Prahran, opening on Tuesday April 12.